Spring themed abc tracing pages cover all 26 uppercase and lowercase letters (download individually). Cut out cards and practice one letter at a time. 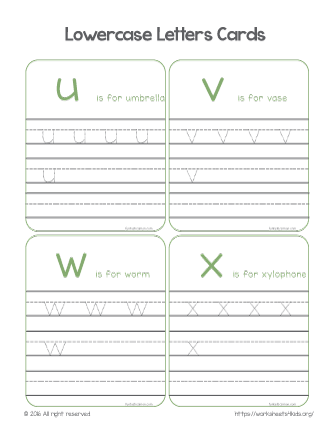 This worksheet covers lowercase letters from u to x, each letter has a spring related word to practice. The uppercase tracing letters you can find here.